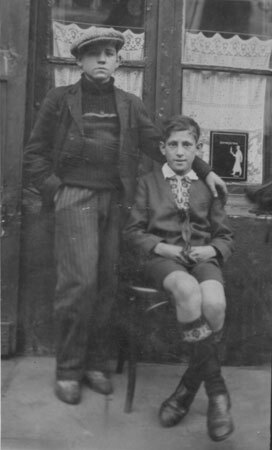 Born 2 August in Nerva, Huelva (Spain), the third o five children born to Mnauela Domínguez Mejía and Gabino Duque Fernández, a miner at Riotinto in Nerva. In the hope of improving their economic situation, the family moved to Saint-Étienne (France), where the father went to work as a miner. Duque started school. He had a passion for Maupassant’s stories and Victor Hugo’s Les Miserables read by the teacher of literature. The drawing teacher hung his work on the walls of the classroom. After obtaining his Certificate of Studies he had to leave school due to his father’s ill heath. He started work as a messenger boy for a grocer’s and later worked in the finishing department of a spinning mill. He used to walk past an art gallery, but he was so shy that he had to look at the pictures from the door, where the “Admission Free” notice was hung. He worked at various jobs in the coal mines, where he spent three years. In his spare time he did pencil drawings and whenever he could he went to the countryside, where he thrilled at the sight of running water or the ground as it became covered in sprouting grass. He joined the local theatrical group, and what really fascinated him was attending the performances and concerts organised by the “Bourse de travail”. Having kept his Spanish nationality and not having done his military service, he returned to Spain with his mother and younger sister. They went to Sabadell, an industrial town near Barcelona where Parmelia, his older sister, lived. He got a job in a wool merchant’s, where one day he happened to discover some left-over colour samples in a corner. He started composing pictures in which, colour was treated with great intuition. With his pictures put together from wool, he successfully presented his first exhibition, at the Sabadell Academy of Fine Arts. 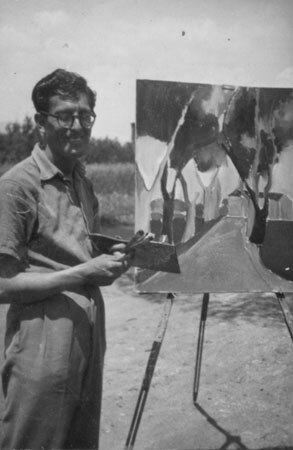 That same year he bought and easel and a box of paints and on Sundays he went to paint outside the town, but he was discouraged by his lack of pictorial technique. He left the wool merchant’s to give classes in French and drawing at the School of Baccalaureate. He took the opportunity to draw his students, to whom he then gave the portraits. After the summer he worked in a factory making mechanical components for motors and alternators. Spurred on by the promise of a grant, he prepared for and obtained the entrance certificate to the San Jorge Higher College of Fine Arts in Barcelona. Later the grant was never conceded. Having acquired pictorial technique on his own, he painted the picture which revealed to him his condition as painter: a still life with a large cabbage. He came into contact with the Barcelona artists. He went back over and over again to the Museum of Catalan Art to look at the Romanesque art. He also paid frequent visits to Barcelona’s Museum of Modern Art. On the occasion of the XXXV International Eucharistic Congress in Barcelona, the Museum of Modern Art held a large exhibition with a number of artists taking part. Duque submitted his picture Jesús, which was singled out for praise by the critics. He received a letter from Paris, from his friend Joan Vilacasas, encouraging him to go there. Before leaving he took his first trip around Spain, with Ramon Folch: Segovia, Salamanca, El Escorial, and Madrid, where he met the painter Daniel Vázquez Díaz and visited the Prado Museum. His thirst for novelty led him to visit all the latest exhibitions and it was in the galleries themselves that he met some of the most avant-garde artist. He made contact with the art critics Pierre Restany and Julien Alvard. Whenever he could he went to the theatre, a concert or a film, interests which were never to leave him. He worked in the restaurant of the School of Fine Arts and frequented the café Les Deux Académies, where he began a lasting friendship with Patrice Goulet, a theorist of architecture. Julien Alvard visited his studio on the rue Bonaparte in St-Germain-des-Prés and was struck by his white painting. 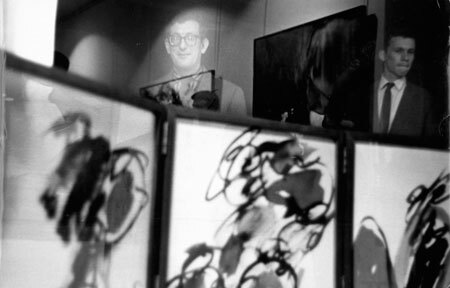 Alvard immediately suggested him taking part in an exhibition at the Galerie Kléber, along with Fautrier, Henri MIchaux, Marc Tobey and others. Finally, “Le vide et l’obscurité” was opened on 13 May, the month in which the Algerian military coup took place and a state of national emergency was declared. The exhibition went unnoticed. He travelled with art-teacher friends to Italy and was dazzled by Giotto, Uccello, Botticelli’s Virgins and the frescoes of Piero della Francesca in Arezzo. In Rome, at the Galleria Tartaruga, he was surprised at how close he felt to the painting he saw there. The gallery owner introduced him to Cy Twombly on the spot, who ended up inviting him to his home. One afternoon he visited the Galerie Breteau in Paris and the director, Denise Breteau, asked him his opinion on the exhibition. After a long conversation, Denise expressed an interest in seeing his painting. This meeting was the start of a close friendship and partnership which was to last many years. .
Duque felt a vital need to develop his work, and found the way to give it greater expressiveness through the use of “gestural marks”. On 24 March he opened his first one-man show in Paris, at the Galerie Breteau, a great success with the public. The presentation was complemented with a flamenco recital by the guitarist Pedro Soler. At the same gallery and spurred on by Alvard, he put on the exhibition “Yann”, along with Benrath, Duvillier and Lerin, with four works by each artist. The expectation which had been generated was justified: Yvonne Hagen and John Ashberry recognized their personal contribution in the chiaroscuro pictures or nuagisme, as the critics called it. Georges Salles, director of the Museums of France, and James Sweeney, director of the Guggenheim, congratulated him for “Yann”. 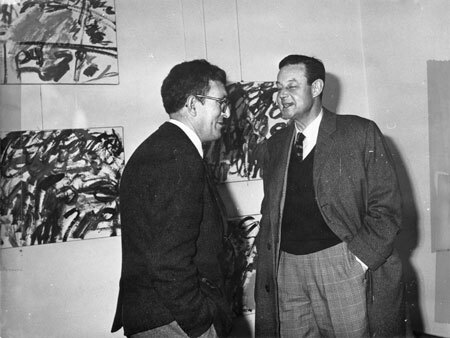 Later, Salles invited him to a meeting at his home and introduced him to Giacometti, whom he met from time to time at the restaurant Tamaris. He was invited by the French government, through the Association Française d’Action Artistique, to take part in the exhibition “Peintures françaises contemporanies”, curated by François Mathey, which travelled to Germany and Austria. In February, “Antagonismes” opened at the Palais du Louvre-Pavillon de Marsan, organised by Alvard and Mathey. Duque’s pictures Vuelo de gritos verdes and En la sombra está quejándose el misterio were exhibited beside those of Sam Francis, Rothko, Messagier and other well-known artists. In spring, at the Galerie Breteau, he exhibited for the first time his graphisme in the exhibition “¡En un jardín he soñado…!” He was no longer a nuagisme. At the beginning of the year his work had been exhibited in Sabadell through the mediation of Llorenç Balsach. That summer he went to Sabadell and promoted the creation of the group “Gallot”, with Balsach, Joan Bermúdez, Lluís Vilaplana, Alfons Borrell, Antoni Angle, Joaquim Montserrat, and Josep Llorens. The group was formed with the intention of bringing the artistic atmosphere of Sabadell up to date by means of actions. The noisiest consisted in unrolling 100 metres of paper in Barcelona’s Plaça de Catalunya and covering it with “gestural marks”. In October “Gallot” was wound up. He made his second trip to Italy. The Spanish government asked him to take part in the exhibition “Art Espagnol Contemporain”, at the Palais de Beaux-Arts in Bressels, along with Cuixart, Canogar, feito, Hernández Pijuan, Muñoz, etc. Carlo Cardazzo, from the Galleria del Naviglio in Milan, bought some of the works exhibited and suggested he spend three months painting in a studio in Venice. He spent the summer in this way, using large-format canvases as well as paper, the latter set aside for “Oeuvres de Venice”, the following year, in the Galerie Breteau. His presence in collective exhibitions establishing the guidelines of modern art was a constant, especially those in Paris in the early years of the sixties. In this climate of recognition and acceptance, his work was described by the critics as “fresh and at the same time ardent, a whole in gestures of magnificent elevation”. “Manuel Duque vous propose La Légende dorée des Dieux et des Héros ou le retour a une littérature picturale”. Thus programmatically the poster he himself designed announced the inauguration on 23 of April of his new exhibition at the Breteau. Duque had placed great hope in this exhibition, but the large canvases with titles such as Le char d’Apollon, La Chute d’Icare or Le Parnasse did not receive the support he expected from the critics. His ideas ignored and he himself summed up as an artist who had turned to figuration, he began to be left out of artistic events in Paris. He travelled to London where he visited the exhibition “British Painting in the Sixties” at the Whitechapel Art Gallery and the Tate Gallery. 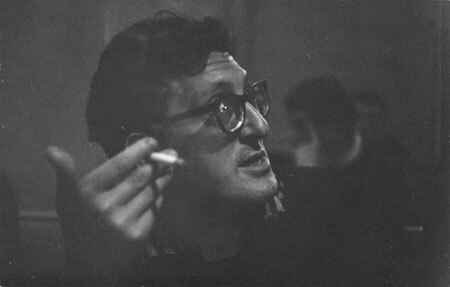 Taking part was Hockney, whom he visited. He started a great friendship with Rémy Audouin, who opened an art gallery in Paris. Through him, also, he met Rose Issa, from that moment on an admirer and loyal friend. In May, at the Galerie Rémy Audouin, he inaugurated what was to be his last individual exhibition in Paris, with work previous to the “Golden Legend”. Once again it was Julien Alvard who, in the magazine Aujourd’hui, praised his painting, which he described as pure. He wrote the manifesto “Rehabilitating Painting”. With Denise Breteau, he organised a series of exhibitions at her gallery which were to serve as a reflection on the state of art at that moment. 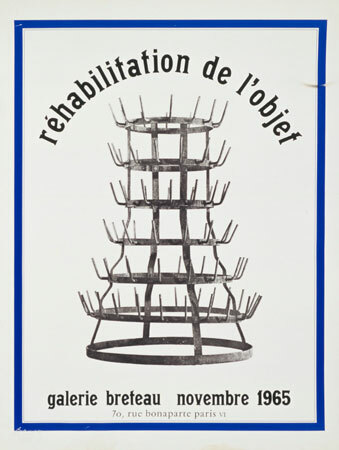 “Réhabilitation de l’object” was the first. It was followed by “Bouguereau” and “La mort d’Apollon et son testament”, in 1968. While staying at the home of the painter Bois-Vives in Courchevel, a flood in his house in the rue Charonne destroyed a large part of his work. Ramón Lizarazu, whom he met in Paris, suggested he move to Madrid where he could offer him his help. Eventually he decided to go and moved in provisionally with his friend José Enrique Azcárate. 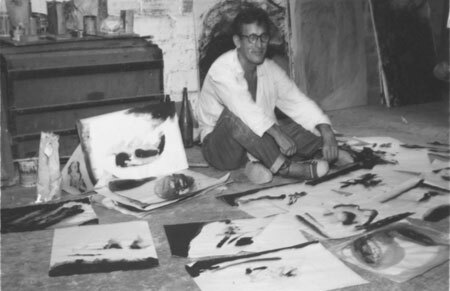 He also looked for his first studio in Sabadell, which was made available to him by Manel Gili. Almost thirty years later, Manel and Duque keep up the friendship born then. He travelled to Turkey and Greece. Julien Alvard, the subtlest and most intelligent French art critic, in the words of Françoise Choay, died in June. From this year on he painted every summer in a studio in Castellar, a town near Sabadell. A period began during which his work was exhibited in San Sebastián, Bilbao, Pamplona and Sabadell, giving rise to much commentary and reviews in the press, in the midst of the silence of the cultural institutions. He took part in the exhibition “Chemins de la creation”, in honour of he critic Julien Alvard, with Hartung, Mathieu, Messagier, Soulages, Tal Coat and others. The young Sabadell artists Ramiro Frenández Saus, Oriol Vilapuig and Pablo Aizoiala, who had come close to Duque’s work at different moments exhibited alongside him in “Ensueño y Naturaleza”, at the Official college of Architects in Malaga. The four took part once again in the exhibition at Long & Ryle in London and at the Victoria Art Gallery in Bath, the latter with the inclusion of Rose Issa. Following this they no longer appeared in public as a group. He continued living in Madrid and paid visits to Sabadell, where the Town Hall now provided him with a studio in the Vapor Pissit, an unused spinning mill. In subsequent years he has exhibited sporadically. He continues working at his painting with inexhaustible vitality, aloof from the servitude and the spurious satisfactions arising around artistic activity. The book Manuel Duque. Una vision retrospectiva 1943-1997, gathering the whole of his works, is released. On November 4, five days after the presentation of his book, he dies in Sabadell at the age of 79. Some friends and relatives of Manuel Duque set up the Manuel Duque Collection, an association that is founded to protect and disseminate the artistic heritage of Manuel Duque. 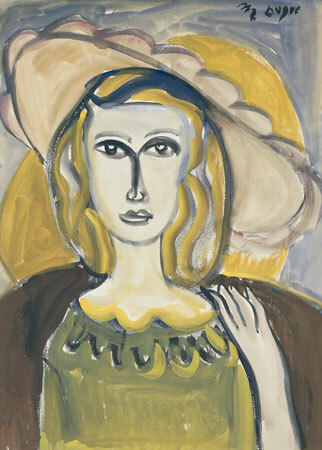 The Sabadell Art Museum inaugurates the exhibition “Manuel Duque. La leyenda dorada o el retorno a una literatura pictórica”, an exhibition that is accompanied by a comprehensive catalogue. 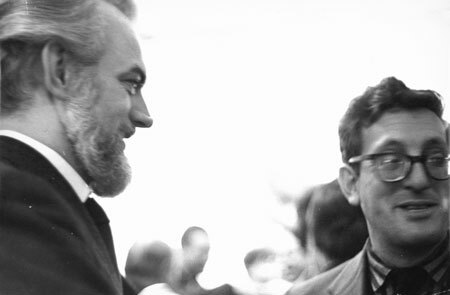 It analyses Duque’s exhibition held in Paris in 1963, which represented a point of inflexion in his work.